Symmetric key ciphers are excellent as long as the key is kept secret. This is not too difficult if only a few people need to share the key. Perhaps they could physically meet and agree on a strong digital key which is stored on a memory stick, for example. Then this can be used to exchange encrypted messages with one another. Another way may be to use a hardware 'dongle' that calculates a key in a time-specific way. The other end also knows the key by doing the same calculation based on current time i.e both ends are effectively sharing the same key. For example a remote employee could be given a hardware key dongle to let them open a VPN connection (Virtual Private Network) back to the office. 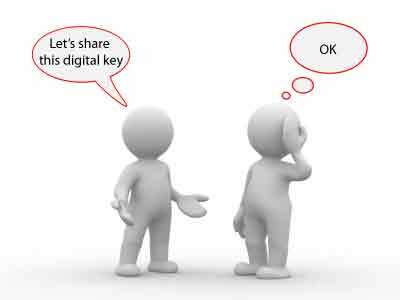 However, with the rise of the internet, email etc, it becomes much more difficult for two random people to share a key because they have to exchange the key over a network. They would have to send the key unencrypted, or the other party wouldn't know how to decrypt the message. But if the unencrypted key is intercepted, then they have lost any security.